The truth is often stranger than fiction! English-born abstract expressionist painter, Barrie Cooke, settled in Ireland and friend of the Heaney family refurbished a disused handball alley in Thomastown, Co Kilkenny in the mid-1980s for the use of Irish landscape painter, Bernadette Kiely. The very incongruity of the initiative triggers Heaney’s opening ‘would-you-believe it’ (a glass roof on the handball alley)! 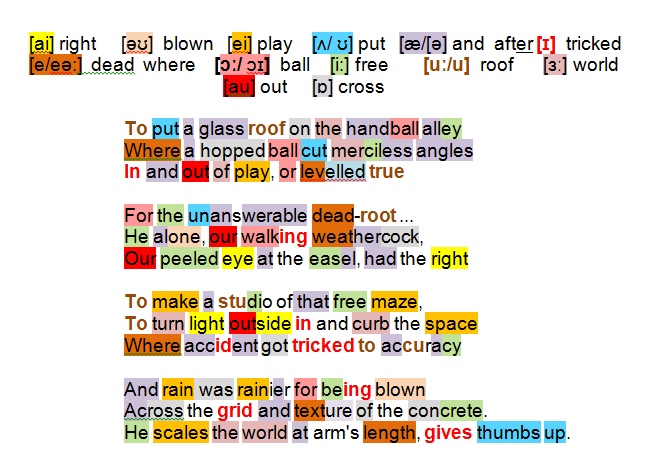 Initially Heaney describes the unpredictabilities of an Irish game played on a rough concrete surface with an erratically bouncing ball (hopped) that might rebound in any direction(merciless angles … in and out of play) or on occasion prove to be an un-returnable drop-shot (levelled true/ For the unanswerable dead-root). Tongue in cheek but with the warmest of smiles on his lips, Heaney focusses on the ‘builder’: only Barrie Cooke from Heaney’s close circle of friends had the right (read ‘had the artistic nerve’) to conceive of creating an artist’s workshop (studio) from such a disordered space (free maze). Cooke’s personal traits were more those of a passionate abstract impressionist than building tradesman: constantly sensitive to minor variations (our walking weathercock), stripping his subject matter down to basics (Our peeled eye at the easel). To Heaney’s mind he could turn light effects on their heads (outside in) and perform optical tricks (curb the space), so that something unintended (accident) turned into something he intended all along (tricked to accuracy); where individual elements became somehow more absolute (rain … rainier) for being part of deliberate design (blown /Across the grid and texture of the concrete). Heaney is all but confessing that while he and Cooke might operate on different creative wave-lengths their approach is not dissimilar! For Heaney the ‘marvel’ is the extraordinary ‘new lamp for old’, a disused recreational space reborn as a studio … and as for Cooke himself, he is a colossus who scales the world, taking painterly squarings, his perspectives determined at arm’s length … thumbs up! Bernadette Kiely (b.1958) Irish landscape painter; returning to Ireland in 1984, she became the first administrator for the Butler Gallery, and a year later took up painting full-time. She works in a studio built by the Irish abstract expressionist artist Barrie Cooke(b.1931) – one of her most important influences – in a disused handball alley in Thomastown, Co Kilkenny.